I've been in Germany for two days and not eaten German food. Last night was Chinese. Tonight, Turkish BBQ. This is what they called a Turkish Pizza. It is a wonder. Every bite revealed a new layer. 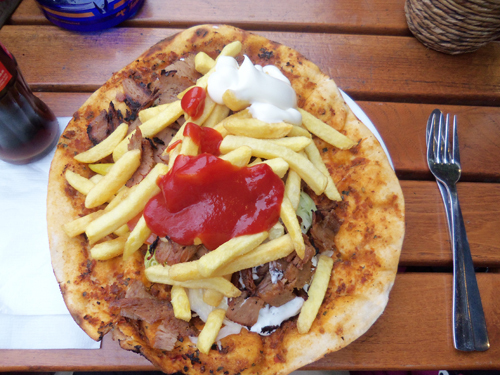 Top to bottom there was - pita, saurkraut, lettuce, cucumber, feta, tomato, tahziki sauce, meat, french fries, ketchup and mayonaise. It's is the Turkish version of a Rochester garbage plate!